This article was written By Colleen Wanglund on 19 Mar 2013, and is filed under Reviews. Fujiko (Junko Ikeuchi) is a dance student on the verge of stardom, having been awarded a lucrative contract from a major film studio. She is a beautiful girl who has also attracted the attentions of newspaper reporter Ota (Keiji Takamiya) and Mitsutake (Tatsuo Terashima), who asks Fujiko to marry him. Three supposed friends of Fujiko, Eiko (Reiko Seto), Kiyoko (Hiroko Amakusa), and Rie (Yasuko Mita) have all become jealous of the young woman’s success and grow to hate her. At the height of her good fortune, Fujiko has an accident while on a picnic with her friends and ends up with an ugly scar on her face, ending any hope of a movie career. She makes her way from the hospital to her home, where she finds her mother dead after creditors have seized everything they had. A note left by Fujiko’s mother tells her to go to her great-grandmother (Fujie Satsuke), Fujiko’s only living relative. When the young girl arrives, she discovers that her great-grandmother is a powerful witch and she convinces Fujiko to take revenge on the people who disfigured her. The great-grandmother promises to heal her scar, but Fujiko sees that it hasn’t worked. In her grief, Fujiko kills herself. In a weird ritual, the witch heals Fujiko’s scar and brings her back to life, but there is a catch. When Fujiko becomes angry she transforms into a vampire-like beast. Fujiko returns as Sayoko, a beauty contest winner and model. She proceeds to take her revenge, but eventually learns that she cannot control her transformation when she changes her mind due to unexpected circumstances. The first thing I’ll say about Vampire Bride is that the title is misleading and doesn’t fit. Fujiko is no bride because she is the actual vampire. Having pointed that out, I will also say that I loved the film. I am a rabid fan of low-budget horror/exploitation films, regardless of where they come from and this definitely fits the bill. It’s a basic story of a tormented girl who doesn’t deserve it, able to get her revenge through supernatural circumstances. Fujiko just happens to be the last living relative of a very powerful witch and that witch can help the nice girl deal out the revenge she is seeking. It is overtly convenient, but Vampire Bride is about the murder and mayhem, not a deep storyline. The special effects are, for the most part, austere with some of Junko’s transformation shots done with hazy editing and camera tricks. 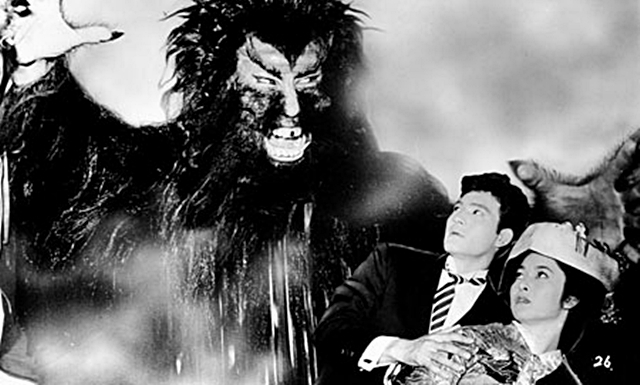 It’s obvious that most of the SFX budget went into the final look of the beast—which was clearly a man. The beast did look pretty good and I noticed that when it bit its victims, the vampire left three bite holes instead of two. Trying to be different, I suppose. One interesting trivia bit: Junko Ikeuchi was a star at Shintoho Studios, but left the studio to get married—against the wishes of studio boss Mitsugu Okura. When her marriage failed and Junko returned to Shintoho, she was given the role of Fujiko as a sort of punishment by Mitsugu. She reportedly did not like the role, but stuck with it as a true professional. Overall, I think Vampire Bride is a really good film and a great example of Japanese exploitation from Shintoho Studios and I thoroughly enjoyed seeing it on the big screen at the Japan Society during its New York premiere. 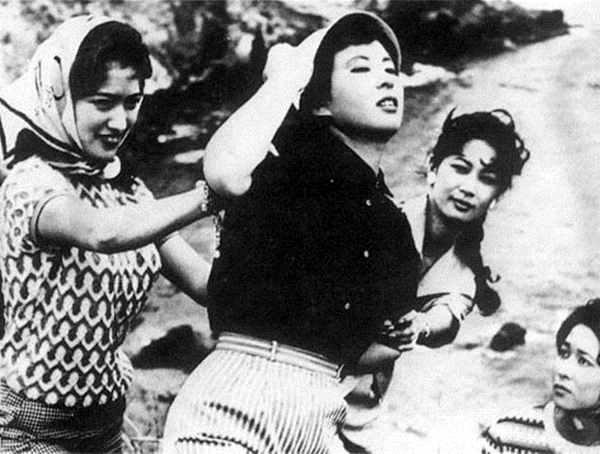 It is a rare film that was shown as part of the Globus Film Series Into the Shintoho Mind Warp: Girls, Guns & Ghosts From the Second Age of Japanese Film, which was originally curated by film critic Mark Schilling for the 2010 Udine Far East Film Festival.